Photo: S.A. Schack Pedersen, Thrust sheets at Loenstrup klint (see interpretation under "26. Supplementary description"). System ED50, Zone 32, x=546464, y=6367470. a. Glacial tectonism. b. Filled in lake. a. Coastal cliff exposing examples of most types of Weichselian Glacial deposits in the Kattegat-/Skagerrak area. The cliff exhibits a repeated succession of glaciotectonically imbricated flakes of meltwater clay and sand, which have been dislocated by ice-push from the north. The imbricated flakes are overlain by in situ till, marine Yoldia clay and Saxicava sand, Late Glacial lacustrine deposits from the Continental Period, Littorina beds, sea peat and aeolian sand. The location of the subsurface Børglum fault at Nørre Lyngby is prominently expressed. 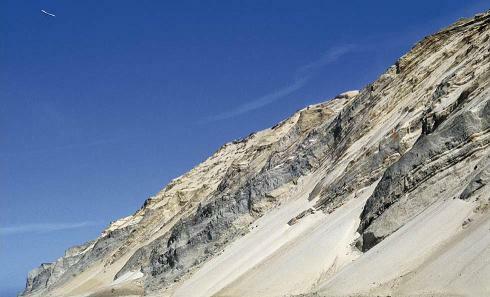 The expanses in the hindland of the cliff, Yoldia and Littorina deposits, are in visible connection to the cliff exposures. See also the interpretation of the entry photo in "26. Supplementary description". b. The freshwater deposits include a filled in lake, which exhibits intercalated Late Glacial cultural and vertebrate remains at the Nørre Lyngby moor. Thrusted and imbricated glacial beds. The elements of the landscape in the hindland (the Littorina expanse in particular) are less illustrative than the area around Frederikshavn. An analogue glaciotectonic imbrication exists at Ristinge klint (GS - 24). In Denmark: Ristinge Klint (GS - 4-3) and the Frederikshavn area (in part the aspect "a"). Up to 70 m above msl. Ca. 15 km long and ca. 300 m east of the coast (4,5 km2). Endogene tectonics along the Børglum fault. Bendsen, N., 1981: Rubjerg Knude Fyr fra 1899 til 1980. Vendsyssel nu og da, 1981, 5p. Bondesen, E, og Lykke-Andersen, H., 1978: The desman, Desmana moschata (L.) - a new mammal in Denmark after the Ice Age. Natura Jutlandica, 20p. Jessen, A., 1931: Lønstrup Klint. Danm. geol. Unders., II. rk., 49p. Krogh, H., 1978: The Late Weichselian freshwater beds at Nørre Lyngby. C-14 dates and pollen diagram. Danm. geol. Unders. årbog 1976. Lykke-Andersen, A.-L., 1987: A Late Saalian , Eemian and Weichselian marine sequence at Nørre Lyngby, Vendsyssel, Denmark, Boreas, 16p. Pedersen, S.A.S., 1986: Rubjerg Knude. Varv, 3p. 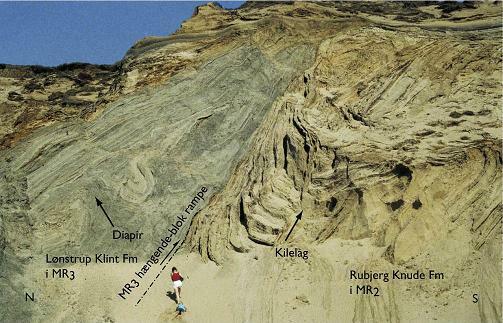 Pedersen, S.A.S., 2005: Structural analysis of the Rubjerg Knude glaciotectonic complex, Vendsyssel, northern Denmark. Geol. Surv. Denmark and Greenland Bull. no. 8, 192 pp. Weitze, H.J., 1981: Rubjerg Knude - en levende klint. Vendsyssel nu og da, 5p. Photo: Two formations with detailed structures in ("i") the thrustsheets MR2 and MR3. "Haengende-blok rampe" means "ramp of hanging block". "Kilelag" means "Vedge shaped bed". Photo S.A. Schack Pedersen. Based on Sjørring, S., 1997, in: Andersen, S. & Sjørring, S., Geologisk Set, Det Nordlige Jylland. Skov- og Naturstyrelsen and Geografforlaget, 208 pp. The cliff is a GeoSite. The extend of hindland inclusion must be considered. The thrusting of the lower Glacial succession, which is most prominent at Rubjerg Knude, is possibly boosted by gravity sliding on the South dipping Prequaternary Chalk surface. In the coastal profile the section with thrust faulting is flanked by undisturbed onlapping Late Glacial marine beds, exemplified at Nørre Lyngby. The marine beds are the Saxicava Sand and Yoldia Clay, which were deposited during a marine transgressive event. In the late Glacial period the sea regressed due to the isostatic rise of the land following the deloading from the melted ice sheet, initiating the Continental Period. More lakes are known from this period, the best known of which is the one at Nørre Lyngby. This lake depression is considered to be probably developed along a subsurface fault, the Børglum Fault, related to the Fennoscandian Border Zone. The lake depression is filled in by a succession of fresh water sand and clay, occassional peat and fresh water sand (Elder Dryas, Allerød and Younger Dryas periods). The cessation of the development of the lake depression in Allerød time is interpreted from the observation that minor consolidation faults in the lower lake succesion tail out within the Allerød beds. The Late Glacial lacustrine beds contain remains of a.o. susliks, bevers, moles, snowhares, reindeers, and ptarmigans. Also a tanged arrowhead in flint, one of the oldest in the nordic countries and giving name to the Lyngby Cuture, has been found in the lake deposits. During the Littorina transgression sand and mud has been deposited up to 10 metres abowe present sea level. The transgression event is datet 8.000 years b.p. based on dendrochronological evidence from tree trunks in the transgressed substrate. The up to 25 metres high aeolian dunes covering the whole area are under continuous accretion. Structural interpretation by S.A. Schack Pedersen of the photo at top of this page.